Organizing Notes: Stop the Insane U.S. Plan for an Airfield on Oura Bay! Stop the Insane U.S. Plan for an Airfield on Oura Bay! We went back to US Marine base Camp Schwap yesterday to discover local activists trying to block a military convoy coming out of the base. When I saw the scene my mind immediately flashed back to 1985 when I was at a conference in Mutlangen, Germany and participated in a similar action. I was in Mutlangen to protest the presence of US Army Pershing II intermediate-range nuclear missiles that Ronald Reagan had deployed there in October of 1983 aimed at the former Soviet Union. The Pershing was built in Orlando, Florida where I was living at the time. I was organizing protests outside of the Martin Marietta (now called Lockheed Martin) plant. My youngest sister was inside soldering the circuit boards for the nuclear missile. I was invited to represent our local peace movement at the Mutlangen conference that was calling for the Pershing to be removed from their small town. We were inside the conference hall that day in 1985 when we got a call saying that the US Army base, placed right inside the center of Mutlangen, had opened their gates and were moving huge trucks (similar to the one pictured above) loaded with the nuclear-tipped Pershing missile. We ran outside and got in front of the trucks and soon enough the police came to drag us out of the way. So memory and instinct sent me right out into the street yesterday in front of Camp Schwab to try to slow the war machine down again - even if just for a moment. I made eye contact with the two GI's in the front seat of the truck - I wanted them to see my sweatshirt that reads Veterans For Peace. They saw me quite clearly. 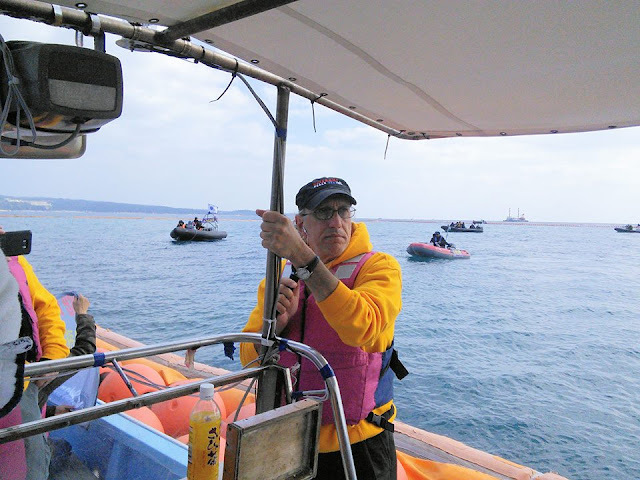 We next went to a local fishing port on Oura Bay and climbed aboard two boats that took us out into the bay for a water protest alongside about 10 peace kayaks that were bumping up against the floating barriers erected by the military. More than a dozen Japanese military units in inflatable boats were buzzing around us and when we tried to use the sound system on board our two boats to speak they attempted to drown our voices out with their own sound systems. This back-and-forth went on for about an hour. Americans often ask about people from other nations: "Why do they hate us so much?" The people of Okinawa are asking these questions: "Why do the Americans make us suffer so much? Why do they destroy our environment? Why do they take our lands? Why do they ignore our pleas for peace and justice? Why do they refuse to close their bases when we demand that they do so?" The words from Washington about protecting 'freedom and democracy' in Okinawa ring hollow. There are about 50,000 US troops stationed on the Pentagon's military colony of Okinawa. I've heard several Okinawan activists use the term 'mafia' to describe their militarized government in Tokyo. That same term could easily be used to describe our 'government' in the US - Washington is run by a corporate criminal syndicate out to make profit from endless war on behalf of resource extraction corporations. The only way we can ever beat these corporate warmongers and be free people again is if we create a global movement of resistance to these death dealing cats who now run the majority of governments around the world. We must join hands planet-wide and keep saying no to the devastation that the war machine brings to our beloved Mother Earth. In my mind there could be nothing more important that we could do with our lives. That means we must stand in solidarity with our friends around the world who are demanding that US bases in their country be closed. It also means that we must stand in resistance at bases and military production facilities in the US and call for an end to America's dangerous addiction to war and violence. The question isn't "why do americans make us suffer so much, take our lands, etc..."
Us regular americans don't want this ! But the imperial capitalists are the ones making the decisions. Us little people have very little power to turn the war machine around. The real problem is the currant right wing Japanese Government. They want to build this for their sake, the gift for US protection of Japan from China and North Korea. 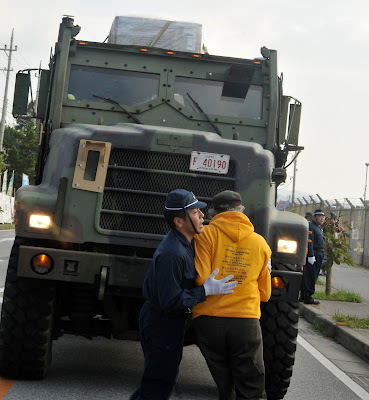 Japanese Government doesn't want dangerous US army base to be in Japan. Okinawa is so convenient as it was during the WW2 as it is now to build more military facilities to protect mainland of Japan without any harm done to their people. As you know, Okinawa was an independent country before Japan annexed it. There is defiantly some discrimination. The way the government forcing this to be build as soon as possible without proper assessents. We, Okinawan lost beautiful nature and culture to the battle of Okinawa of WW2 but also our stupidity destroyed whatever left for us(Economy! Development!). Oura bay is a rare, unspoiled beautiful spot left in mainland Okinawa. 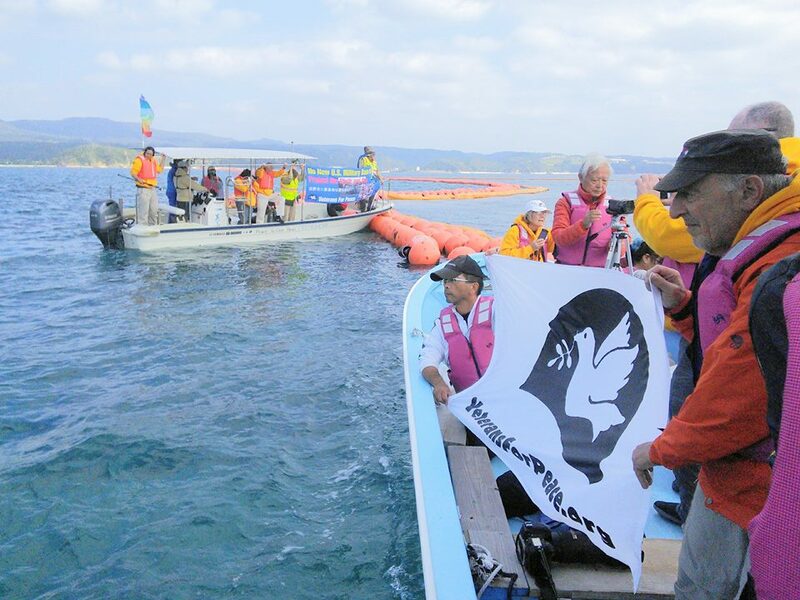 Please help us to protect our nature and our rights from barbaric Japanese Government Action. Please give US government pressure too. We need more global recognition for this issue. Erika, if the majority of Americans actually understood what was going on in Okinawa today, the majority of Americans would be absolutely disgusted with the US Military. I served in Okinawa in the 90s, when I left I left in tears. What you need to do is send a powerful message. Theirs no question that the real heroes here are the Okinawan people. Okinawa's occupation is awful many times over. Has anyone ever brought to light the disturbing businesses that thrive thanks alone to our service folks (a.k.a. the banana show, etc)? Seems it's not something you'd write home to mom about. The few, the proud, the degenerate.